Day Six is a death march. I think we’re all suffering from post-Bandon syndrome, and the withdrawal symptoms are severe. Either that or we’re all just dead dog tired. We’re all just kind of going through the motions here. Unfortunately, Myrtle Creek wasn’t the most inspirational course, especially coming right off the heels of Bandon Dunes. It was a mountain course in the middle of nowhere (or God’s Country as my uncle Ron would say). A couple of cool downhill par 4’s on the front nine, but overall a bunch of back-and-forth quirky or downright wacky golf holes. It was what Jimbo and I described as a ‘throwback’ course. Very little land was moved, lots of parallel holes, no yardage markers to speak of other than the 200-150-100 marks on the cartpaths. The three of us decided that the motto for Myrtle Creek should be ‘the course you need to play more than once, but you wouldn’t want to’. It’ll come out somewhere ahead of OGA, but not by much. At least we were able to take carts. Definition of a throwback. 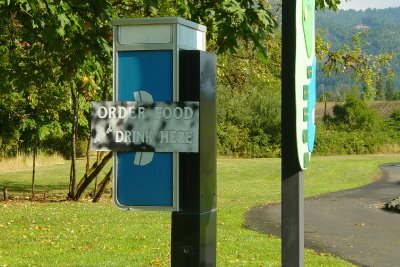 Put your lunch order in on the 9th tee from this payphone. As I alluded to, I was beat and didn’t play great. None of us did. But I did keep it together pretty well on the back and ended up with 42-38 80. Jimbo took a trip on the double-bogey train for three holes in a row on the front nine and battle back problems to a 44-43 87. I think Ken was half expecting his caddie Lisa to be standing there on the first tee. He could’ve used her around the greens...he ended up with a disappointing 49-49 98. Myrtle Creek was not a difficult golf course. Our three was whittled down to two as Jimbo had to bail out early due to back problems. Bandon claims yet another victim. We dropped Jimbo off at the airport and had to high-tail it over to Pumpkin Ridge to make our 3:40 tee time. We made it out there with about two minutes to spare. I’ve been wanting to play out at Pumpkin Ridge for a long, long time. The private course, Witch Hollow has hosted some USGA events like the US Women’s Open and a US Amateur awhile back, and is hosting the US Women’s Am next week (I’m sure most of the players from the Curtis Cup at Bandon stuck around for the week to play in the Amateur). 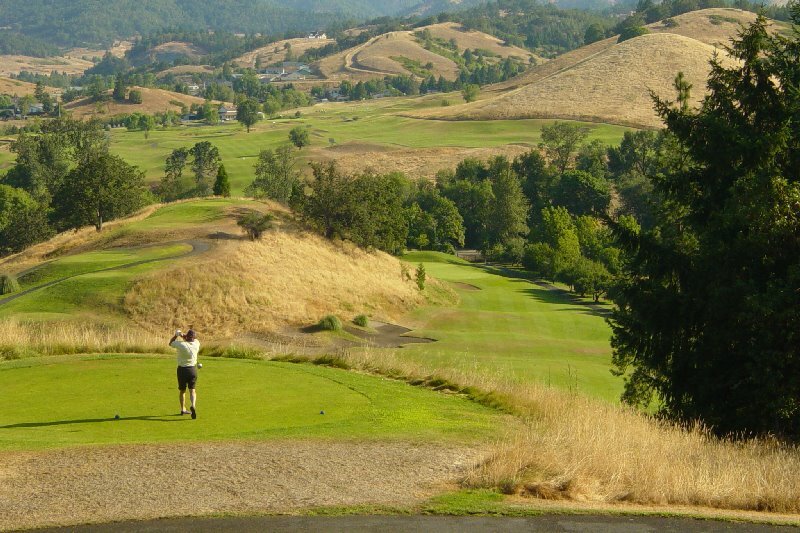 The public course, Ghost Creek, has continually been rated as a top 100 course. Perhaps my expectations were a little too high. We started on the back nine for some reason and the back nine is pretty pedestrian. Things don’t really get interesting until the 17th and 18th hole. However, the front nine more than makes up for it...it’s great. The holes are tight and very wooded, and many holes have the Ghost Creek bisecting or running alongside. It’s a wonder that they don’t flip the nines permanently...both nines start and end pretty much right next to each other, so it would be pretty easy to do. One of the benefits of having the 36-hole private/public split (this must be a Portland thing, because nearby Reserve Vineyards has the same deal) is you get quality conditions consistent with a private course. Pumpkin Ridge was in great shape, with firm and lightning fast greens (although they take this to an extreme, with a ridiculous permanent cart path only policy. What a joke). That was quite a problem with the smallish greens, as I had problems holding the greens and was just off the fringe on at least half the holes. It was actually quite an adjustment getting back to normal parkland golf after three days of pure links golf...my first instinct was to just use the putter from off the green. Instead, at Pumpkin Ridge you needed to those high-touch pitch shots with the lob wedge, sometimes only 15-20 feet from the hole on a firm and fast green that’s running away from you. Unfortunately, I didn’t have the energy to try to grind it out and finished the trip with a 43-41 84 in a round where I actually hit it much better than my score would indicate. Ken struggle again but managed to somehow keep it in double digits...51-48 99.